Hugh Richardson’s collection is the larges of those covered by the project and has its own complexities and difficulties in developing a methodology by which images could be dated and identified. This is partly because the collection included images acquired over fifty years or more, Richardson first going to Lhasa in 1936 and remaining intermittently until 1950. 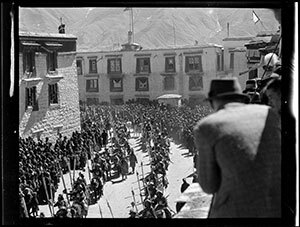 During this time he seems to have had a changing relationship with photography as a pastime and an evolving range of photographic interests reflecting his deepening familiarity with Tibet, its language and culture and his burgeoning scholarly interests and aspirations. The earliest images reflect his fascination with many of the same subjects as his 1936 Mission contemporaries and an interest in the Tibetan artefacts that he acquired. Yet very quickly after the other Mission members left in 1937, one finds his use of Tibetan terms increases in the Mission Diary that he continued temporarily and in his letters home (see Richardson Archive in the Bodleian Library) and the path had evidently begun on which he was to develop his idiosyncratic transcription system and more scholarly interests, both of which are evidenced historically through both the content of his images in the collection and in the manner in which he attempted to narrate them through inscriptions and handlists etc. The collection includes a wide variety of negative types and print types and various types of other performance such as colour transparencies ranging from the earliest experimentations with colour (see Formats page) to modern slides made in the 1970s and beyond. There have also been a number of attempts to record Richardson’s own narratives of his images, as indicated above, with a number of handlists being made and Richardson himself inscribing place names etc. on the back of many of his prints. It may be of some surprise to Tibet scholars, however, that even a man as scrupulous in his attention to detail can be seen to reconfigure his collection over time with identifications of places being altered and other errors of memory impacting on image identification. However, as may be appreciated in relation to the Chapman collection, this kind of variety often proves the key to identifying distinctions between images and thus dating and identifying them. A careful examination of the prints, especially the contact prints, enabled a number of related groups of images to be identified, partly because they could be seen to have been made as part of the same batch at the same time. However, these print backs have not been reproduced digitally on the website because of the time and resource constraints of the project and, being mainly text rather than other annotations, the information can be reproduced in the relevant notes and additional information fields. A further resource at our disposal was the Hugh Richardson manuscript archive at the Bodleian Library in Oxford. Rare but very useful references are made in this directly to photography, particularly for clarifying when he started to use different types of camera and so forth, but the archive also proved very useful for establishing a chronology of Richardson’s activities during the period 1936-39 in particular from his official diaries and letters to his parents. The chronological detail of the 1940s is more sketchy, reflecting the changing relationship Richardson had with Tibet and his burgeoning scholarly rather than popular interests, and the changing demands of government, which was no longer interested in reproducing travelogue style narratives of adventures at far frontiers from their overseas staff nor of receiving official correspondence detailing the minutiae of everyday life in post. The complexity of the Richardson archive means that many of the dates are provisional, but further detailed research would surely be able to provide more insights into this aspect of the collection. Place identifications and broader date ranges have been made possible by relating the collection to Hugh Richardson’s copious academic output, especially the text High Peaks, Pure Earth [REFERENCE], which details many of his tours to sites of interest outside Lhasa and gives some dates. This has enabled also the reconstruction of some of his trips photographically. Image content has also been important in identifying other features of the collection, particularly relationships between different images of the same places and peoples over time. Again, the digital process itself assisted this by enabling thumbnails to be included in the project database.